Karnic calls its 1851 (5.65m) an Open. The rest of the world would call it a centre console. Names aside, it is an exceptionally well thought out and fitted out boat. 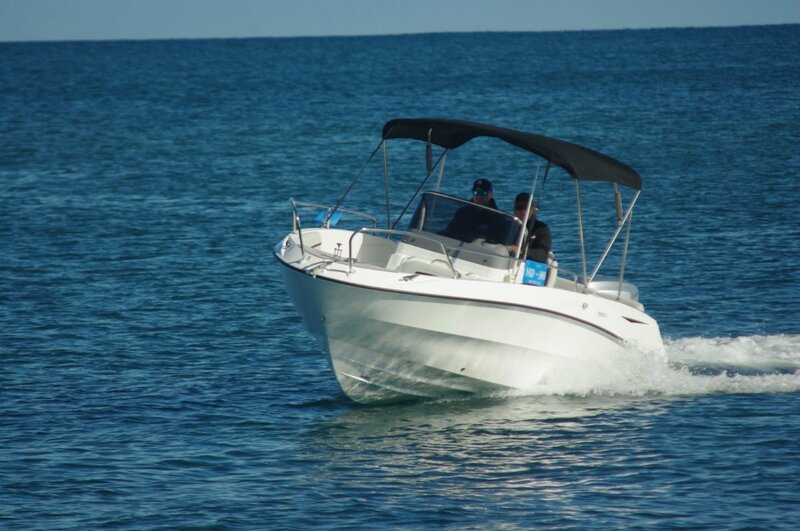 Unlike the majority of this style of boat it appears intended less for fishing than for comfortable getting around - a picnic boat; a Rottnest day boat. The fibreglass construction alone tends towards this: most fishing is done from aluminium boats. The fibreglass work is visually excellent. This European boat comes from moulds that see a volume of production pretty much unheard of in Australia, yet appear to be maintained in pristine condition. A consequence of mass production is that everything is moulded rather than constructed. It makes for easily cleaned surfaces and pleases the eye. The whole front of the console tilts – seat and a section of deck included. It reveals a space big enough to install a chemical toilet, which could be a good idea on what is likely to be a family day cruiser. Alternatively it could provide more storage than you could think of a use for. This is a fairly wide console meaning that the seat is comfortable for two people. It faces a trio of seats at the bow; for lunch or sundowners a table drops into the deck socket. For those who still favour the tanned look an infill with cushions can turn the fore section into a sun lounge. Adding to the storage volume, below the bow seats are self-draining bins that could be receptacles for wet bathers and towels or could moonlight as iceboxes. The Karnic is well endowed with seating: including the two excellent pedestal jobs at the driving position there are seats for ten in a boat rated to carry six people. 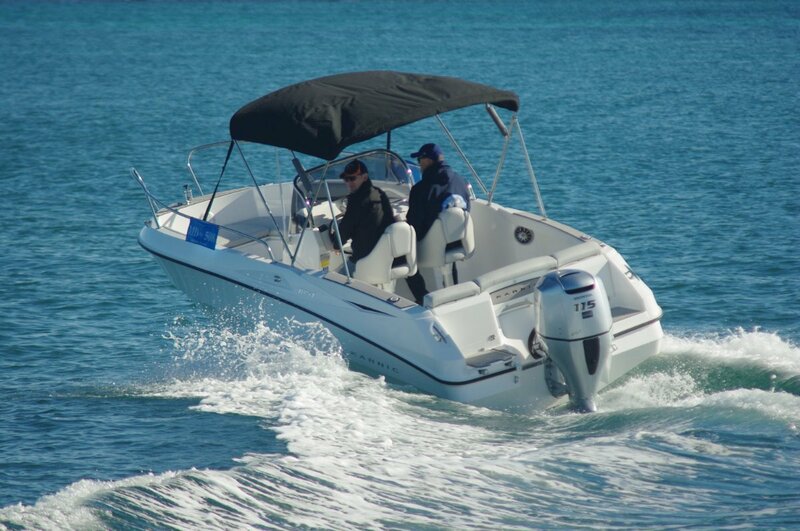 Rather than being an extravagance it is offering choice: for ocean trips canny passengers will inevitably opt for the trio of seats at the transom, looking for comfort rather than the windblown look. Kids of course will fight to sit up front. Those rear seats have more storage below and behind them. Not all that easy to get at, requiring the lifting of tightly fitting cushions, and with some of the volume consumed by the battery. But still, Karnic demonstrates that it wastes no room on what is not a particularly large boat. Occupants of the driving and navigating seats get most of the full beam Bimini’s benefit, but it is big enough, and with enough elbow room under it, to shelter a cluster of standing class passengers. That’s just how it is with centre consoles – always take a big hat with you. For those standing alongside the console, a perimeter rail around the windscreen gives them something to hold onto. Apart from the bow rails there are not a lot of other hand holds on board. The 115hp Honda is pod mounted so no splash well intrudes on the passenger space, and boarding platforms are incorporated on either side of it. A buyer might well fit boarding ladders to both of them as the Karnic would be likely to spend time as a swimming platform. The chosen deck cladding too would be better than carpet for boarding swimmers: that excellent Sea Dek material. That Honda did a fine job for us. Power and propeller were well matched to the boat, allowing us to have a little fun; only small amounts of power trim were needed for any manoeuvre. 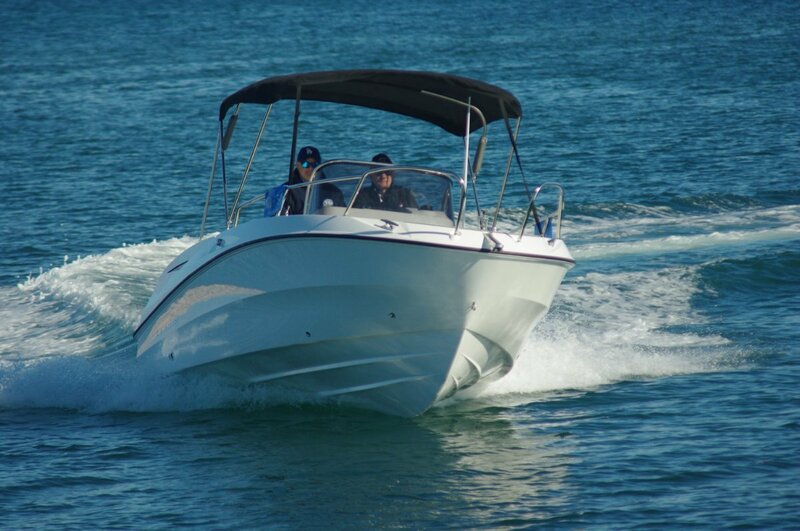 The aura might be of a family boat but it also performs. We played in the high 20s of knots and played hard. On the mild day it was faultless whatever we asked it to do. And not the least pleasant feature was its quietness: the hull was silent and the motor hushed, particularly when we dropped to cruising revs. 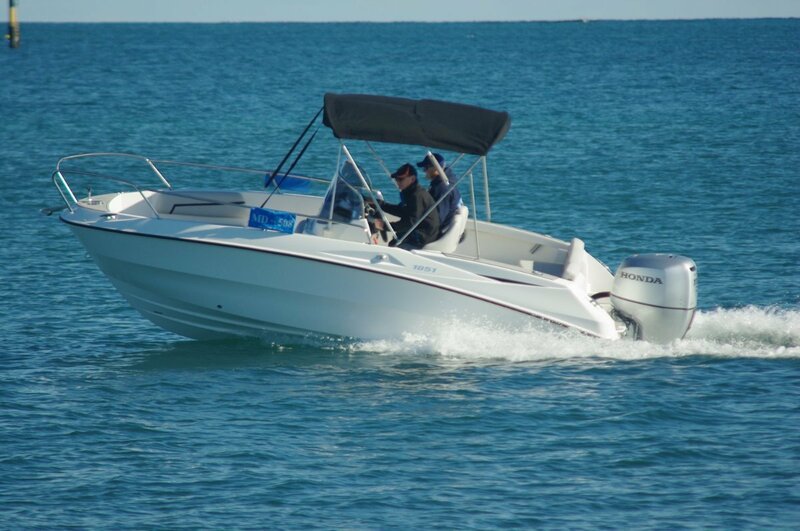 Practically all new boats bigger than dinghies seem to mount some kind of stereo system, and the Karnic is on trend with a Bluetooth-compatible set up neatly integrated into the console’s layout. I am glad to say it was not switched on that day, though I accept that for many a day on the water needs music.